Bhí bliain den scoth againn i gColáiste Lú idir cúrsaí acadadúla agus cúrsaí seach-churaclaim. Míle buíochas le hIn. Ní Channan a chur físeán le chéile de bhuaicphointí na bliana. Ag súil go mór le 2018/19! We had a great year in Coláiste Lú both academically and with extra-curricular activities. Many thanks to Iníon Ní Channan who put together this video of the year's highlights. Looking forward to 2018/19! Gach lá cuirtear béim ar chúram, ar fhorbairt agus ar fheabhas anseo i gColáiste Lú. Tugtar tús áite i gcónaí do chúram na scoláirí agus iad ag baint forbartha agus feabhais amach. I mbliana chaith muid lá spraoi i Tayto Park mar scoil ag céiliúradh na mbuanna a bhí ag gach scoláirí i mbliana idir bhuanna pearsanta, buanna acadúla agus buanna seach-churaclaim. Bhain gach duine an-sult as an lá agus muid ag céiliúradh phobal Choláiste Lú. Is féidir grianghraif ón lá a fheiceáil san album thíos. Every day in Coláiste Lú we strive for care, development and excellence. We emphasise the care (cúram) of our students above all else as they achieve development and excellence. 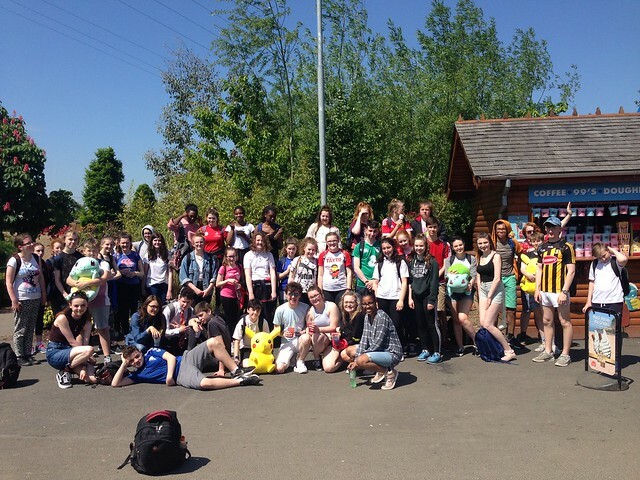 This year we spent a fun day as a school in Tayto Park, celebrating all of our students' achievements this year; personal achievements, academic achievements and extracurricular achievements. Everybody greatly enjoyed the day as we celebrating the Coláiste Lú community. Photographs from the day can be viewed in the album below. Bhí scoláirí Rang Chonchúir ag obair go crua le tamaill anuas ar a dtionscadail OSSP. The students of Rang Chonchúir have been hard at work lately on their CSPE projects. Comhghairdeas ollmhór le Naoise ó 1 Sadhbh a bhuaigh an 3ú háit in Éirinn lena dán do Chomórtas Filíochta Sheachtain na Gaeilge. 'Mo Scoil' is ainm don dán a chur Naoise isteach sa rannóg sóisearach. Maith thú a Naoise! Comghairdeas freisin le hIníon Ní Chonluain, a múinteoir Gaeilge. Congratulations to Naoise from 1 Sadhbh who won third place in Ireland with her poem for the Seachtain na Gaeilge Poetry Competition. Naoise entered her poem entitled 'Mo Scoil' or 'My school', in the junior category for first to third year students. Well done Naoise! Congratulations also to Iníon Ní Chonluain, her Irish teacher. Tá cóip den amhchlár do Scrúduithe an tSamhraidh 2018 ar fáil anseo. Ádh mór ar na scoláirí uilig. Is deis iad na scrúduithe samhraidh chun forbairt agus feabhas pearsanta a mheas ag deireadh na scoilbhliana. A copy of the Summer Examinations 2018 timetable is available here. Best of luck to all students. Remember, the summer examinations are an opportunity to assess your personal development and academic achievements at the end of the school year.